Lot:5016 Friedberg 83 (W-669). 1907 $5 Legal Tender Note. PCGS Currency Choice New 63. Face Proof. Friedberg 83 (W-669). 1907 $5 Legal Tender Note. PCGS Currency Choice New 63. Face Proof.Hessler-Unlisted. Printed on India paper, mounted on wide margin paper. Imprint of Bureau, Engraving & Printing. Black and white portions of the face only. Style and designs of the traditional Pioneer Family or "Wood Chopper" notes. Center, man holds axe, wife and dog in fore of home. Lower left, Andrew Jackson. Engraved signatures. Zero numbers perforated in both serial number blocks. Another extremely important face proof of one of most collected federal types. A sharp proof with some corner glue wrinkling. The perforated numbers stray over slightly to the right portion of the vignette. 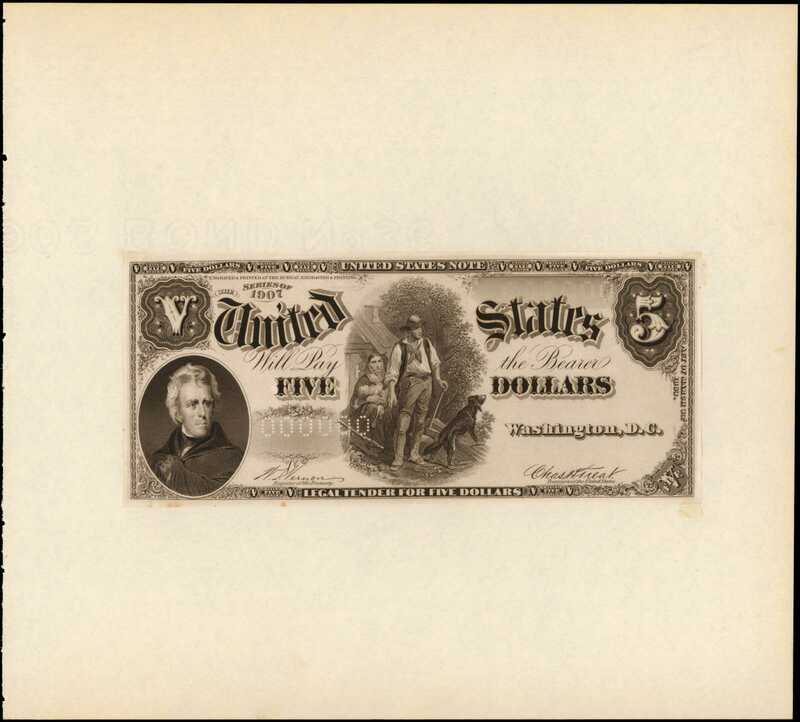 Originally offered in Stacks 2010 Americana Sale where a remarkable archive of federal proofs were offered. By 1907 the Pioneer Family design had been standard for nearly 40 years.ppppppppppppppppppppppppppppppFrom Stacks Americana Sale, September 30-October 2, 2010, lot 1073.